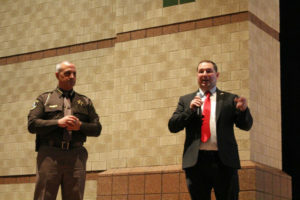 Macomb County Sheriff Anthony Wickersham (left) and Jim Santilli, CEO of the Transportation Improvement Association (right) speak to Dakota High School students about distracted and impaired driving on January 10, 2019. MACOMB TOWNSHIP, Michigan, January 17, 2019 – Jim Santilli, CEO of the Transportation Improvement Association (TIA), and Macomb County Sheriff Anthony Wickersham spoke to Dakota High School students about the tragic consequences of distracted and impaired driving last Thursday. The presentation was hosted as part of the student-led Strive For A Safer Drive (S4SD) program. Dakota High School is one of sixty-two Michigan high schools that was accepted into the S4SD program, a public-private partnership between Ford Driving Skills for Life and the Michigan Office of Highway Safety Planning. As part of the S4SD program, schools receive $1,000 for students to create a teen-led traffic safety campaign to educate their fellow classmates. According to TIA, 1,028 people were killed and 78,394 injured in 314,921 reported traffic crashes in Michigan during 2017. 479 deaths resulted from single-vehicle crashes. The majority of the presentation focused on distracted driving. According to the National Highway Traffic Safety Administration, 3,450 people were killed and 391,000 were injured in crashes involving driver distraction during 2016. Prior to the presentation, Santilli and Wickersham also met with leadership students to discuss traffic safety.